There is no clear evidence of how Monea came to possess the diamond, according to court documents. He allegedly told others involved in the case that he owned a diamond mine in Africa and that he received the diamond from a friend. 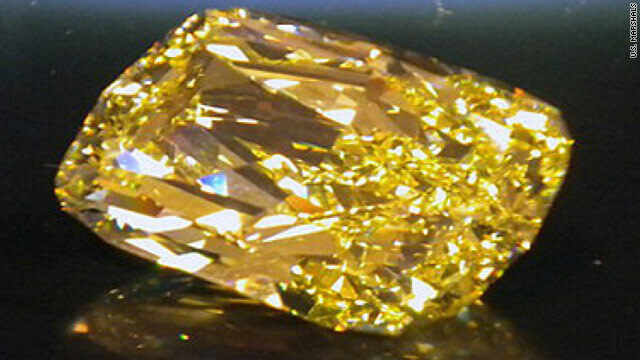 The diamond was forfeited to the government by a district court judge in 2007, the Department of Justice said. Legal claims delayed the process until March, when the final forfeiture was ordered and the U.S. Marshals Service acquired it. The U.S. Marshals Service is responsible for selling seized and forfeited properties acquired by federal criminals through illegal activities, the DOJ said. Proceeds from the auction are used to compensate victims, pay for law enforcement initiatives and support community programs, according to the Department of Justice. It doesn't seem right to me that they can auction off something that they don't know where it came from. This guy was obviously a crook so its origin should really looked into! how do you conspire to sell something that you already lawfully own, or did i miss something where someone CLAIMED he stole it from them,,,,,,,, no, i didn't see that, so it must be the case of IF THE FREAKING GOVERNMENT WANTS IT, AND IT IS MORE VALUABLE THAN THEIR WORTHLESS PIECES OF POOP PAPER THEY ARE PRINTING BY THE BILLIONS, THEN IT MUST BE CRIMINAL IN NATURE AND MUST BE CONFISCATED UNDER THE CIVIL ASSET FORFEITURE LAWS SO THEY CAN SPEND IT HOWEVER THEY WANT TO. SHEEEESH! WHEN ARE WE GOING TO MAKE THEM STOP THIS FRAUD? What an interesting situation. Would a immigration counseling lawyer in Chicago Illinois be able to help with such a situation?